President Trump lashed out at a frequent foe of his while hosting an event for Native American code talkers at the White House Monday, honoring war heroes who used their native language to outwit the enemy and protect U.S. battlefield communications during battle in World Wars I and II. Mr. Trump hailed the men as "special people" who have an ultimate "love of the country." He also took the solemn occasion to acknowledge the history of the native people in America while seemingly slamming Sen. Elizabeth Warren, D-Massachusetts, as Pocahontas, a reference to claims she made about being part Native American in the past. "You're very, very special people. You were here long before any of us were here. Although we have a representative in Congress who they say was here a long time ago. They call her Pocahontas. But you know what. I like you. Because you are special, " Mr. Trump remarked. Mr. Trump has called her "Pocahontas" in the past in reference to questions about Warren's heritage. The controversy stems from a flap that originated with her Senate campaign, in which she was unable to prove definitively that she had Native American heritage. Pocahontas was the daughter of chief Powhatan and a member of the Pamunkey Tribe, while Warren has claimed to be part Cherokee. Warren responded to the remarks during an appearance on MSNBC shortly after the ceremony, saying it was "supposed to be an event that honored heroes." "It is deeply unfortunate that the President of the United States cannot even make it through a ceremony honoring these heroes without having to throw out a racial slur," said Warren. She added, "Donald Trump does this over and over thinking somehow he is gonna shut me up with this. It hadn't worked in the past, it is not gonna work in the future." White House press secretary Sarah Huckabee Sanders disputed that assessment, however, telling reporters at the White House press briefing Monday afternoon that it was a "ridiculous response" to call the name a racial slur, saying it was not the "president's intent." "I think what most people find offensive is Sen. Warren's lying about her heritage to advance her career," she added. Navajo Nation President Russell Begaye said in a statement after the remarks, "In this day and age, all tribal nations still battle insensitive references to our people. The prejudice that Native American people face is an unfortunate historical legacy." Begaye added, "As Native Americans, we are proud people who have taken care of this land long before there was the United States of America and we will continue to fight for this Nation." National Congress of American Indians President Jefferson Keel also expressed his concern, saying in a statement, "We regret that the President's use of the name Pocahontas as a slur to insult a political adversary is overshadowing the true purpose of today's White House ceremony." Keel added, "We honor the contributions of Pocahontas, a hero to her people, the Pamunkey Indian Tribe in Virginia, who reached across uncertain boundaries and brought people together. Once again, we call upon the President to refrain from using her name in a way that denigrates her legacy." 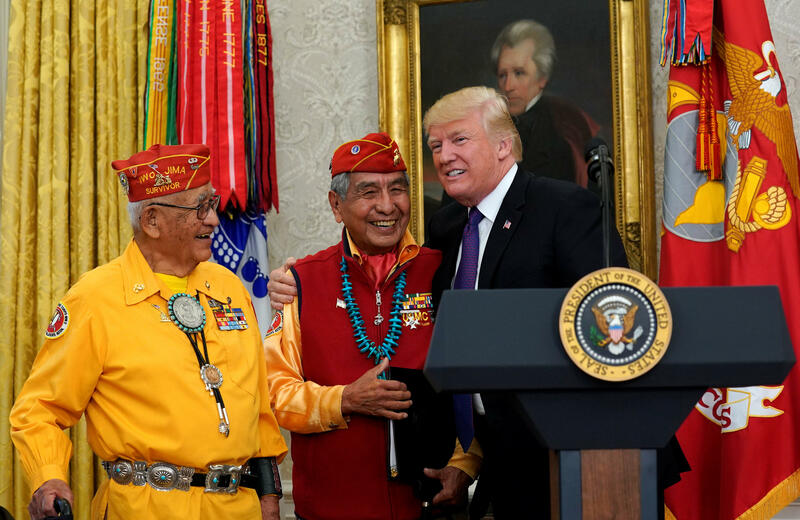 At the event Monday at the White House, the code talkers called for a museum to be built in honor of the war heroes to educate children, something Mr. Trump said he would help them do. "You deserve it," he said. The code talkers described the harrowing experiences they undertook during their time defending the United States during the battle of Iwo Jima. Only 13 surviving Navajo code talkers still remain. On November 20, 2013, in Emancipation Hall at the U.S. Capitol, 33 tribes were recognized for the dedication and valor of Native American code talkers to the U.S. Armed Services during World Wars I and II. Of the tribes recognized, 25 were presented with their Congressional Gold Medals. Members of Native American tribes exchanged sensitive military information by transmitting military plans to each other in their native tongues on the battlefield. Since in some cases, their languages were unwritten, they were able to communicate in a way that confused German enemies trying to break U.S. military codes.